"Honorable mention – Biomedicine and Neuroscience, 2011 Prose Awards"
"The fruitful pursuit of biological knowledge requires one to take Einstein's admonition [on science without epistemology] as a practical demand for scientific research, to recognize Waddington's characterization of the subject matter of biology, and to embrace Wiener's conception of the form of biological knowledge in response to its subject matter. It is from this vantage point that we consider the epistemology of the cell." In the era of high biological data throughput, biomedical engineers need a more systematic knowledge of the cell in order to perform more effective data handling. 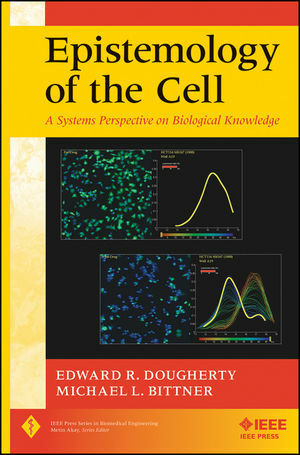 Epistemology of the Cell is the first authored book to break down this knowledge. This text examines the place of biological knowledge within the framework of science as a whole and addresses issues focused on the specific nature of biology, how biology is studied, and how biological knowledge is translated into applications, in particular with regard to medicine. Epistemology of the Cell is written for biomedical researchers whose interests include bioinformatics, biological modeling, biostatistics, and biological signal processing. EDWARD R. DOUGHERTY, PhD, is Director of the Genomic Signal Processing Laboratory at Texas A&M University, where he holds the Robert M. Kennedy '26 Chair and is Professor in the Department of Electrical and Computer Engineering. He is also co-Director of the Computational Biology Division at the Translational Genomics Research Institute as well as Adjunct Professor in the Department of Bioinformatics and Computational Biology, M. D. Anderson Cancer Center at the University of Texas. Dr. Dougherty has published more than 300 peer-reviewed journal articles and book chapters. MICHAEL L. BITTNER, PhD, is co-Director and Senior Investigator at the Computational Biology Division at the Translational Genomics Research Institute. Previously, he was associate investigator in the Cancer Genetics Branch of the National Human Genome Research Institute at the National Institutes of Health. Dr. Bittner holds a dozen patents and has published more than 100 articles.